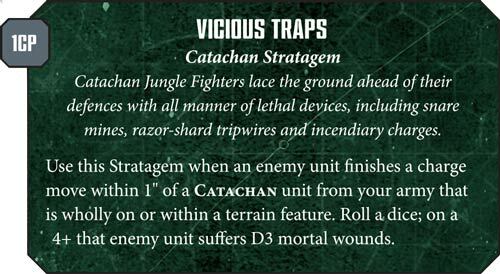 Catachan Vicious Traps "within terrain" rule? What defines a terrain feature? Obviously if you're in a piece of jungle/forest terrain then that counts. But a lot of battles have small rocks, walls, ruins which people hide behind and shoot out of, claiming that they benefit from a cover save. Is it then acceptable to claim that these count as terrain features? It then gets complicated as you can get charged from behind where there is obviously no cover, but what happens with the traps? Edited by Wassa, 16 May 2018 - 01:21 PM. First ,the enemy is assuming that they have managed to break thru your line. In truth they are behind you because you have let them. They are charging into your trap. Even when attacking from behind you are ,Catachan. Doesnt the rule book define what constitutes a terrain feature? Id suggest its anything that would interact with a model. Eg having to move up / down or around it or modifying the units save. Maybe discuss with your opponent beforehand particularly if you think you'll use the stratagem. Maybe a good one for the FAQ email? The rule stipulates that the Catachan unit that is WHOLLY on or within terrain. This means, to me, that it must be big enough to contain your models. If the terrain is a few scattered things, like rocks, clarify with you opponent before the game and define some boarders. At start of game area of terrain pieces should have been defined and agreed. Woods - area of base of trees (if based) - or trees mark edge with straight line between them being wood boundary. Buildings - base of terrain piece - or as is quite common with ruins in 'L' shape, a straight line across the back edges. As always in a game be chatty - lso if moving or setting up just talk to your opponent "I'm setting these up in this terrain - can you confirm they are all in it" etc. Only vague area would be barricade rule - just clarify with opponent at start... you'll probably find that reminding him that you are going to use a strategem to cause mortal woulnds when they charge you gives you more of a benefit as a pysch out than the strategem does in game! !